DIRECTVÃƒÃ‚Â® AU9S Ka/Ku signals need to be amplified to a constant high level and extended to multiple distribution locations. Model LAL204a may be placed as close as 50 feet from an AU9S dish and provide an automatic gain controlled output of -20 dBm (with 64 equal input transponders). T Model includes power supply. 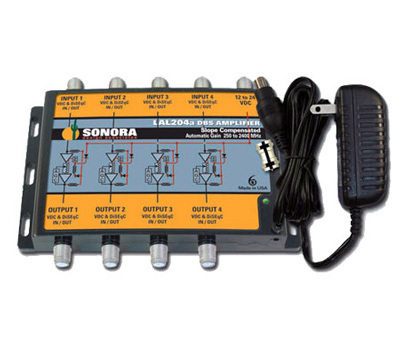 Amplifiers may be coax line powered from either their RF input or RF output connectors. Amplifiers may be externally powered via their power input connector. Model LAL20a-T, LAL204a-T and LAL205a-T include an external power supply.